In the southwestern United States, this bat is most common in rugged rocky canyons and cliffs, where crevices provide favored daytime retreats. Some roost sites are occupied throughout the year, but the four seasons are usually spent in different roosts. The greater mastiff is capable of fast and prolonged flight; the wings are long and slender and the flight membranes are tough and leathery. 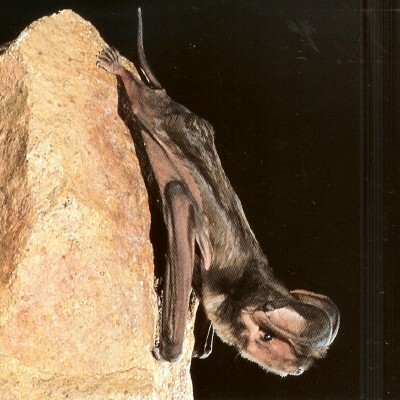 These bats live in high, dry places, and usually cannot get airborne from the ground, but will scramble to a post or a tree to gain height for launching. They produce a high-pitched call that can be heard when they are flying up to 300 meters (990 feet) above ground. Colonies are small, usually less than 100, and adult males sometimes are found in maternity colonies. Males have a dermal gland that becomes enlarged during the mating season. When enlarged, this gland produces a thick, oily secretion with a strong odor that may serve to attract females. Mating occurs in early spring when the dermal gland is most functional. Parturition dates usually vary more in this species than in any other bat in the United States; May to September. One baby ordinarily is born; twins are rare.